… den ganzen Satz und das Post-Mortem lade ich später hoch, wenn alle Fehler behoben sind. Zuletzt geändert von Krishty am 07.02.2017, 01:08, insgesamt 1-mal geändert. bis auf das cockpit schauts gut aus, könnte da noch ein fehler vorliegen? Now, what about the other data (X, Y, Z, Q)? We have seen Z before: It’s the GPU instruction for drawing a triangle. (I chose a different plane here because I was too lazy to take another screenshot for the article, sorry!) Nice smooth shading and the seams are exactly where a designer would place them! Zuletzt geändert von Krishty am 08.05.2017, 22:45, insgesamt 1-mal geändert. 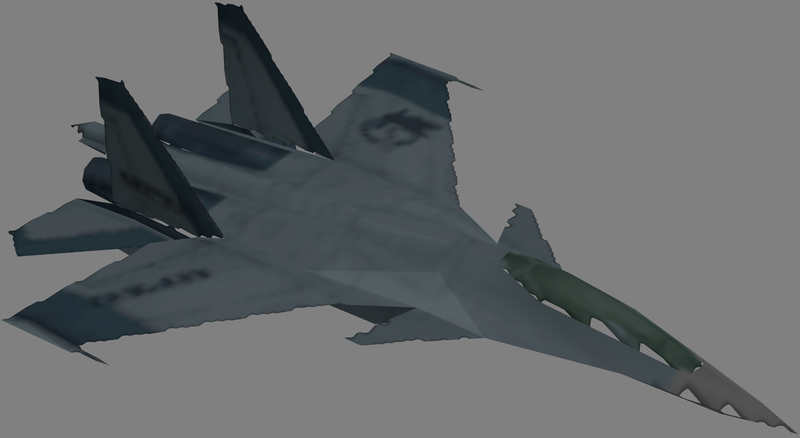 Just announcing three new "hidden" levels in the Japanese version of Ace Combat 3. One hidden level has been known for years: Game Show, the level that shipped on demo discs, with minor modifications. It can only be accessed through a GameShark code (i.e. overwriting a memory location) and it's pretty boring. Its internal name is "----", and the developers probably used it as a test bed for AI before deploying the game. Another hidden level has been known for some time, but nobody ever managed to enter it: Mission Code. There are some snapshots of the briefing on Acepedia, but the game will crash right after that. I'm pretty sure I got its map decoded, and there's two copies of that map in the Japanese game files. It's Expo City in an early development stage. The differences from the final city are subtle, but it's amazing to see all the improvements that have been done. The map data looks compatible with the final data format, but the only airplane is the carrier for the Sepia spacecraft. This may be the reason why the briefing loads, but the mission doesn't. Then there's two completely new maps. This time, the binary format of the models is not compatible with the final maps at all. I suspect the game will crash right away, and this might be the reason no one ever investigated the data. It's Expo City in some state after Mission Code and Megafloat in a *very* early stage of development. I have yet to find out how texturing works; even the vertex colors are screwed up. I'll try to post snapshots of the early Expo City soon. Snapshots of the two other maps follow later. I have so many things to write here, but my PC does not have an internet connection, so it'll take some time to publish it all. Zuletzt geändert von Krishty am 03.05.2017, 22:23, insgesamt 1-mal geändert. I proudly present the first snapshot of the Mission Code version of Ace Combat 3's Expo City map! Expo City's iconic underground airport (top-left corner) has been introduced rather late. The early version didn't have one. The early version featured more buildings. The remaining buildings have been scaled down to as little as half their original sidelength (bottom-right corner). Texture detail has improved significantly (bottom-right corner). Prebaked lighting has improved significantly. The early version is brighter (about twice as bright). I tried to correct for it in the snapshots, so it's not obvious. It's not an art thing -- I guess at some point they compressed the color range of the prebaked vertex lighting and instead improved the texture color range. The reasons could be obscure color processing problems with the PSX GPU, or optimizations, or anything else. I'll resume the plane extraction tutorial shortly, then I'll write about extracting maps. Alsways impressive how much NAMCO got out from a system like PS One and what tricks they used to accomplish that. Thanks for sharing your reengineering work with us guys! scheichs hat geschrieben: Alsways impressive how much NAMCO got out from a system like PS One and what tricks they used to accomplish that. Thanks for sharing your reengineering work with us guys! Extracted the hidden/secret levels/maps/terrains/missions from Ace Combat 3. This is the alpha version of Expo City. I explained its unique features in an earlier post. This is probably what you’d see if the hidden Mission Code level worked. It’s not as close to the final version as Expo City’s beta is, but … it uses the same exotic mip mapping approach, so it must have been created at the same time. Megafloat was completed much later than Expo City. At a late point during development (when Expo City was almost in its final state), Namco tried to replace the game’s entire texture management with a more efficient approach, which likely allowed for mip mapping or farther range of sight – but they failed and rolled back to the old system. I extracted the model viewer’s data as well, and to my surprise, the models were slightly different from the ones you see in the video. We could have known earlier: the first two planes in the video are not lit dynamically (turning them upside-down does not change lighting), while the 3rd plane (at 1:18) is indeed lit dynamically. The reason I found: some models are so buggy/have so bad resolution that Namco chose to use the in-game models instead! Zuletzt geändert von Krishty am 04.05.2017, 00:18, insgesamt 2-mal geändert. Again very cool stuff! Do you have some polygon numbers? It appears to me that the beta versions have higher polygoncount than the final ones. So you’re right – the betas were much more detailed! Amazing results, thanks a lot for sharing those results! It’s even more confusing when you see this tweet from the developers, where the trademark was already in place. They probably just forgot it in the original game files. However, the Demo version does differ from the full games. More specifically, binary data on the levels is slightly different. This may be different placement of enemies, but I’ll have to check further. Zuletzt geändert von Krishty am 05.08.2017, 00:37, insgesamt 3-mal geändert. The project ain’t dead, I’m just still working on the giant GPU writeup. You may have noticed that many buildings are still missing – I already extracted their geometry, but I didn’t get around decoding the coordinates for placing them on the map. Meh. Mein deutsch ist nicht das beste aber ich möchte es ausprobieren. Ich habe diese topic mit Intersse schon verfolgt. Es gab jemand, der in meinem "AC3 text replacement" thread auf Romhacking.net nach Models fragte. Waren Sie es? Ich finde das geil dass Sie haben alle diese alpha/beta/final Karten und informationen auf AC2 gefunden. Ich bin hier mehr weil ich würde eine Frage machen: könnte ich Ihre AC3 unpacker für meine AC3 Englisch fan-Übersetzung projekt benützen? Ihre program hat einige wichtige Vorteile, zum Beispiel einige neue menus und kleiner Grafische Elemente. Das ist besser als esperknight's AC3 toolkit und kann eine vollere Überstzung machen. Glad to finally meet you :) As a quick introduction to the other members: You’re the leader of the English translation project I mentioned earlier. DragonSpikeXIII hat geschrieben: Es gab jemand, der in meinem "AC3 text replacement" thread auf Romhacking.net nach Models fragte. Waren Sie es? Ich bin hier mehr weil ich würde eine Frage machen: könnte ich Ihre AC3 unpacker für meine AC3 Englisch fan-Übersetzung projekt benützen? Ihre program hat einige wichtige Vorteile, zum Beispiel einige neue menus und kleiner Grafische Elemente. Das ist besser als esperknight's AC3 toolkit und kann eine vollere Überstzung machen. Of course; use it for whatever you like! That’s why I post it here, after all :) I can give you the source code if you need it, but be warned it’s a bit messy. I didn’t know it catches more files than the other tools, but I’m glad to hear that. Krishty hat geschrieben: Glad to finally meet you :) As a quick introduction to the other members: You’re the leader of the English translation project I mentioned earlier. Likewise :) and thank you for mentioning my fan-translation project to the German side of the Internet. That's thanks to esperknight and gipphe then, responsible for understanding AC3's compression and file structure. They have since moved on to other things, but they would definitely appreciate the fact that people other than me and my team have gotten some use out of their data and tools, even improving on them. HUGE thanks for this, more things can be translated now! :o I'm going to add this new development to the next progress report and I've already added your name to the credits. I've run some tests on the things I previously mentioned, such as the blue menus and the UPEO loading screen and they all work even without re-compression, which is very lucky because in AC3 some menus will break the game if the translated TIMs are too big/not re-compressed. And thank you for offering to share the source code, I would have accepted it if my team's programmers were still active but when it comes to me, I guess I'll just use your finished product. It works on every version and as far as I know, extracts and decompresses everything esperknight's program did plus a lot more, and all you have to do is drag and drop, great work! Genau :) Ich bekomme nicht viele Chancen zu Deutsch sprechen. Das ist genug für mich, danke! That's pretty much all I have to say but before I go, I think your discoveries would make for a pretty cool new post on my AC3 blog, I think I'll post about it soon and link to your thread here. You can grab my model viewer there! Along with Ace Combat 3, Namco released a press kit with some promotional material for magazines. I’d love to get my hands on an alpha or beta version, but sadly, there are almost no leaks of PSX games. The autumn winter collection ’99 press cd 3 contains some of the same snapshots. There seems to be an even earlier version of Expo City as well, all green. I’m desperately trying to find Japanese promo disks. There have been vast amounts of unique AC3 promo material (e.g. VHS videos from the final version), but most of it seems to be lost now. Zuletzt geändert von Krishty am 05.07.2017, 22:23, insgesamt 2-mal geändert. Let’s continue where we left off last time. Finding this was a lot of trouble – I picked polygons from every palette region in a texture and compared their bits. Even more important, this is wrong and will not work with anything beyond planes. However, The Right Approach™ requires detailed knowledge of the PSX GPU, and I’ll dedicate a future article to it. Using the seven palettes in a plane texture, create seven textures. Every polygon picks the right texture. Project individual polygons back to their textures and apply the according palette to the projected pixels. The second approach sounds overly complicated. You probably won’t get what it’s doing until the next GIF. So why the hell should we do that? Because 1. won’t work with other data for the same reasons as the palette index trick won’t work with anything but plane meshes. Been there, done that. You need to trust me on this one. … and save the projected result. // Ensure that the triangle is counterclockwise on the texture! // You may want to use a distance field to improve results on overlapping surfaces! // Is it inside the (padded) triangle? All playable planes can be textured using this approach. You can grab the archive at USEA Today (thanks to DragonSpikeXIII for that)! However, texturing the terrain is a little more complicated … I’ll dedicate another article to that. If you are younger than 35 years (and also a graphics programmer), you’re probably used to the way memory is managed in modern graphics APIs. But memory management on the PSX is vastly different from that, and so in a surprisingly visual way! You create a texture object and, in return, get a handle to it. Using this handle, you fill the texture object – typically by passing an array of pixels. When drawing, you pass the texture object handle to the API and it is applied to the new triangles in the back buffer. This process is entirely transparent. You have no control whatsoever about where specifically in video memory (VRAM) your texture is placed. You cannot access VRAM directly. You don’t even know a single VRAM address! I don’t want to go into discussions about whether this is a good thing, but on consoles, full hardware control is typically what developers want (and that’s where new APIs like Vulkan are heading as well). This means … addresses. Pointers. Bit twiddling. The PSX VRAM is 1 MiB large, but that’s not important here. The important thing is: It’s not an array of bytes, it’s an array of pixels. A two-dimensional array of pixels! Read that again. The entire video memory is an image. An image of 1024×512 pixels, with a top-left corner of (0, 0) and a bottom-right corner of (1023, 511). Did we have a GIF yet? Here’s the animated VRAM content for a shooter. Textures are streamed from the CD-ROM drive to VRAM during loading. The first frame uses two textures on textured triangles before the frame is sent to the TV screen – without pointers or addresses, just via 2D coordinates. PSX games wouldn’t use textured triangles for sprites; the PSX GPU has a hardware blitting device for sprite rendering. My 1337 MSPaint skillz are just not sufficient to draw real perspective polygons. Triangles can also be rendered into the off-screen area – Render-to-Texture – and the on-screen area can be used as a texture, respectively. This can be used to generate impostors, draw fancy particles, or to simulate haze. If the triangles exceed the display area (e.g. if they’re off the right screen edge), one must be careful not to overwrite the textures! 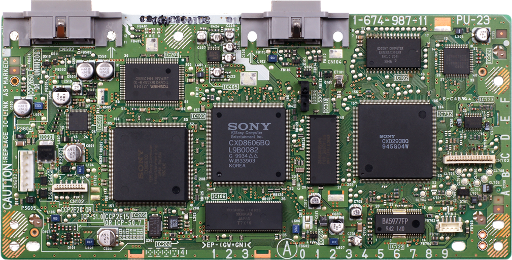 The PSX maintains a hardware flag to mask off drawing to the display area or to off-screen space. 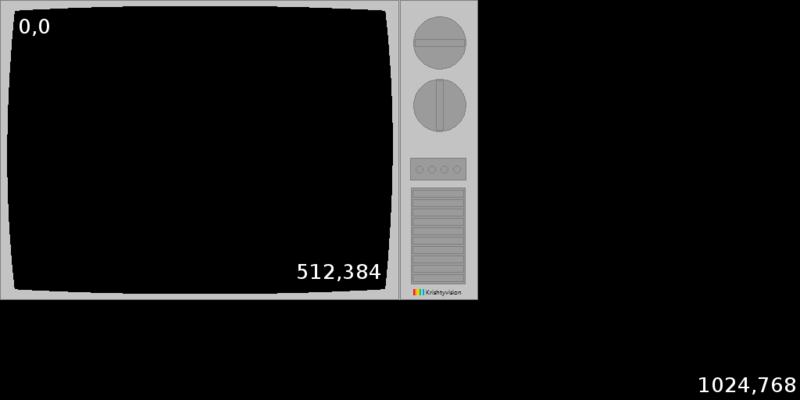 Very few games used the 640×480 resolution from my sample. PSX games usually chose a significantly lower resolution in order to have more room for textures and intermediate values. You can use tools like PSX-vram to inspect the VRAM of games during gameplay. Since the VRAM is addressed in pixels (16-bit color depth – R5G5B5A1), we’re left with a big problem – paletted textures. I’ll explain that next time. Wow, thanks for that explanation. This is indeed a surprisingly manual management of VRAM. I wonder how they dealt with potential self-overwriting of drawing actions. You mean, with Z order? No, more like: I draw a triangle at the "screen" border and it draws over a part of the texture I use right now. Sets the drawing area corners. The Render commands GP0(20h..7Fh) are automatically clipping any pixels that are outside of this region. Amazing sidenote: I just had a look at Arthur Richards acanalysis tool. This tool was made for Ace Combat 4 (2001), Ace Combat 5 (2005), and Ace Combat Zero (2006) – all of which were developed for the PlayStation 2, probably with the same game engine. The tool works barely with Ace Combat 5 – the UI shows a list of data items, but I can’t expand or read a single one of them. I can’t see airplanes like the screenshots promise. However, when I extracted a data item, it started with … Ulz. That’s the Ace Combat 3 compression method I mentioned earlier on, which I discussed with Infrid. My decompressor works with that specific data item. It even identifies the directory layout from Ace Combat 2 and Ace Combat 3 in the extracted data. I didn’t even plan to extract the PS2 games, and it’ll be a huge amount of work. But what overwhelms me is Namco using the same compression method for CD-ROM data on the PSX’s 32-MHz CPU and for DVD-ROM data on the PS2’s 299-MHz CPU, and our extraction code working with two generations of game consoles. Namco even ported their 1997 data layouts to the 2005 game! Compatibility ftw! *lurk* just wanted to tell you that i really like this thread! keep it going, it's interesting !